Thanks everyone for your votes and lovely comments. I took this shot at the Aran Islands most famous cliffs. I was there to shoot a documentary and had a chance to fly (hard to believe, but it was a windless day). When I was above the ruins I loved the contrast between them and and the ocean. For the first time I brought the family with me abroad while I was working and we spent great time in Ireland. I vote for Alex being a cheater ;) Well done sir. Jealous of you and this of course makes us mortals very nasty. Like you say - Loving the contrast between the two halves of the scene and just looking at it has me a bit dizzy. 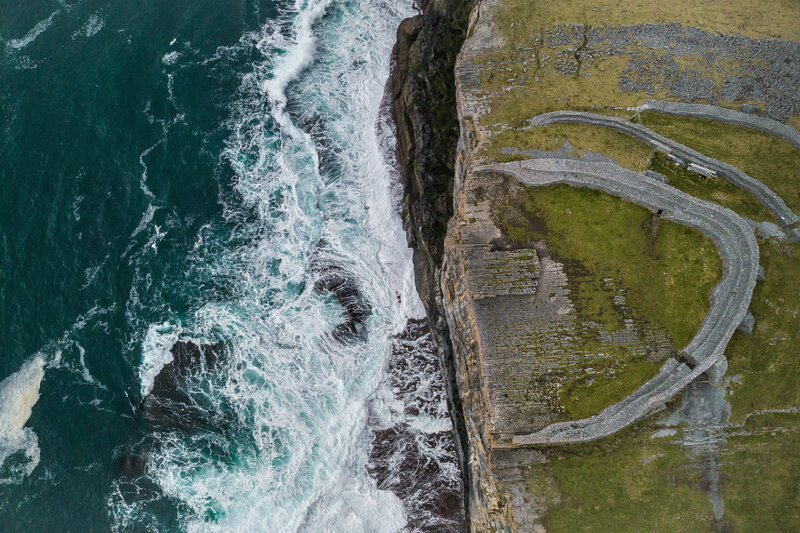 Beautiful photo of Ireland from an angle you don't often see. I am going on holiday for 2 weeks to Ireland this August - one week in Kerry and one week in Connemara. I can't wait! Congrats on the blue! many congrats on your blue ribbon .. altho i'm just repeating what i said in voting ..
obviously i'm making a joke ..
doesnt get more 'archaeological' than this ..
of course i googled it .. !! .. BRILLIANT .. love love love drone photography ..
excellent the way the water seems to almost encroach on the land .. or is it vice versa .. the pattern of the waves is magic .. this is truly awesome .. Fascinating subject and excellent picture. I wish I knew some more about the ruins. Proudly hosted by Sargasso Networks. Current Server Time: 04/24/2019 11:51:31 AM EDT.